You are probably using your garage door more often than your main door. It is therefore necessary to keep it in good condition always. When you know about proper garage door maintenance you can keep the door functioning smoothly and prevent from any damage or injury that may be caused due to faults in your door. 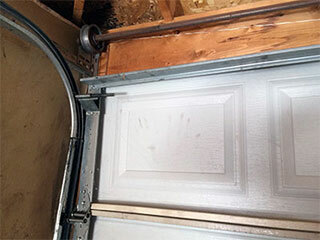 Knowing about the garage door tracks is very important for identifying any fault or damage and repairing it immediately. In overhead garage doors, spring tension is the main force behind the door movement. The doors move on tracks made of galvanized metal. The tracks are fixed to the walls and heavy springs help in movement. The tracks should be checked regularly for smooth movement of the door. Dents or damage should be identified and repaired. A damaged spot in the track can be hammered using rubber mallet or using a wooden piece and hammer. If the damage is severe, it is best to replace the tracks or consult a specialist from our company. Any damage to the tracks can be avoided by keeping them free of excessive grease. Using a detergent and soft brush to remove grease and cleaning the rollers helps in proper movement of the door on the tracks. Both tracks should be wiped and the rollers kept dry to avoid rust formation. Another important thing you need to do is check for loose garage door parts like screws or bolts. The loose screws can be identified when you observe the door while it is moving. The loose screws and bolts should be tightened securely to prevent any injury or damage. The next important part in track maintenance is checking the proper alignment with the help of a level. Tracks should be in level with garage walls for efficient operation. If they are not aligned, you need to loosen mounting brackets and realign the tracks. The safe operation and prolonged use of the door depends on proper maintenance. Most often, a simple repair is sufficient to keep the tracks working properly. However, if you cannot identify any fault or do not want to try the repair yourself, it is wise to call us at Garage Door Repair Andover.